1. Get 1 hour of cardio every day. This means just doing SOMETHING – dancing, walking, riding the bike…something to get my heart pumping and my fat cells shrinkin’. 2. Conquering the stair stepper. I’m working on my New Years resolutions already, but I know there will be 11 small ones (since it is 2011) and probably half of them will involve fitness or things from my 30 list. I turn 29 on Jan 30th and my goal is to be 299 by then. This would mean I could be under 200 before 30. Having weighed over 400 pounds in January of this year…that’s AMAZING to think about! 1. If I have no control over the restaurant chosen, eat a small healthy meal and drink a large glass of water before going. 2. If I do have a choice in the locale, pick someplace with lots of good options and few temptations (Chinese = no good). 3. If I am splurging that night I can have a small dessert (or share a big one with a friend) so long as I have gone to the gym that day. No gym? No dessert! Do you guys have any tips for staying on track during the holidays? Are you making resolutions? How often do you keep yours? 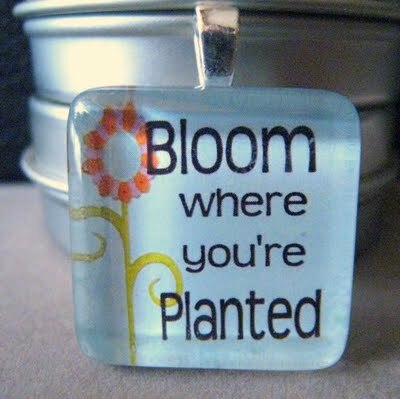 Oh, my last little tidbit is my new favorite quote: “Bloom where you’re planted“. It’s such a fabulous saying that I first heard from a friend a while back. While you may be surrounded by weeds, you can make the most of your circumstance by blooming right where you’re planted!